Gridwall and Slatgrid are one the most inexpensive wall systems we have at American Retail Supply. By adding gridwall base, legs, and connectors, you have just created a free moving wall display. We have gridwall star, triangle, or gondola base shapes and they either fit 3 or 4 panels. Even though gridwall base comes in different shapes, each displays your products at different angles. This matters because as your customers roam throughout your store, a triangle and star base will be easier to upsell products near the counter while gondola, which is wider, are better for creating aisles. Another upside is the rollers attached to the base to freely move your display fixture from one side of the store to another, while gridwall legs are stationary. All of our gridwall bases and legs can be connected by our joining clips or cable ties. 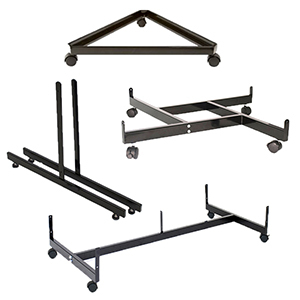 Gridwall display bases and legs give body and structure, they are a great addition to your gridwall and slatgrid panels from American Retail Supply. Order online or pick up your phone and give us a call to speak with a LIVE person, we always love to talk to our current or potential future customers, 1-800-426-5708.